An international team of researchers has successfully recorded the birth of a nanoplasma for the first time. In their paper published in the journal Physical Review Letters, the group describes how they pulled off this feat and what they learned from it. Nanoplasma, as the name implies, is a plasma that occurs at the nanoscale. Scientists have discovered that they can create one by firing a laser at a very small cluster of atoms—doing so is part of the science of studying objects at the nanoscale to learn more about their properties. 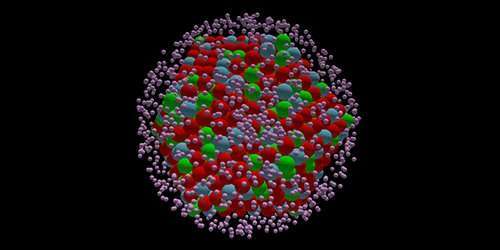 To that end, scientists would like to know what happens as nanoplasma is formed, but have found it difficult to determine because formation happens so quickly. In this new effort, the researchers have taken a step toward that goal by developing a way to record the birth process of a nanoplasma. The technique involved isolating a cluster of approximately 5000 xenon atoms in a vacuum chamber and then firing an X-ray laser pulse at it—that caused the nanoplasma to form. To record the process, they fired a second laser at the cluster—this one with an infrared beam—and recorded the absorption pattern it created. By firing the second laser over and over at a femtosecond time resolution and recording the patterns after each blast, the researchers were able to make a video from the snapshots that were created. In studying the video they had created, the researchers found that the electrons that were forced from the atoms by the laser blast did not all leave at the same time. Instead, they found that after just 10 femtoseconds, a lot of the atoms had absorbed some of the laser energy while keeping their electrons, and a few others lost theirs. After that, it was the attraction between the free electrons and the positive ions that held the developing nanoplasma together. This state led to a lot of collisions which resulted in sharing of energy between the atoms. The researchers report that it was the excitement of the atoms that played a significant part in the migration of energy—something that had never been seen before. They conclude by suggesting their technique offers a valuable new tool for the study of nanosized matter. X-ray free-electron lasers (XFELs) made available a new regime of x-ray intensities, revolutionizing the ultrafast structure determination and laying the foundations of the novel field of nonlinear x-ray optics. Although earlier studies revealed nanoplasma formation when an XFEL pulse interacts with any nanometer-scale matter, the formation process itself has never been decrypted and its timescale was unknown. Here we show that time-resolved ion yield measurements combined with a near-infrared laser probe reveal a surprisingly ultrafast population (∼12fs), followed by a slower depopulation (∼250fs) of highly excited states of atomic fragments generated in the process of XFEL-induced nanoplasma formation. Inelastic scattering of Auger electrons and interatomic Coulombic decay are suggested as the mechanisms populating and depopulating, respectively, these excited states. The observed response occurs within the typical x-ray pulse durations and affects x-ray scattering, thus providing key information on the foundations of x-ray imaging with XFELs.